Austin Healeys were produced from 1952-72. The cars were raced in the Le Mans and the Sebring circuits. 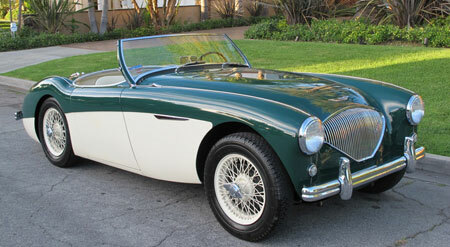 Austin Healey was recognized by the Sports Car Club of America from its onset. The D and E Austin Healey production classes have won National Championships. In 1953 several land speed records were set by an Austin Healey at the Bonneville Salt Flats in Utah. No wonder you can have so much interest when you sell Austin Healey. There are basically two models, the 100-4 and 100-6, and 3000 series. The Austin Healey 3000 was built from 1959 to 1967. It came in two models a 2+2 and a two-seater. The original Mark I has a 2912cc engine with twin carburetors and front disc brakes. The Mark II had an improved camshaft and three carburetors. In 1963 the Mk III was introduced. It was the most powerful and luxurious. You’ll find walnut veneer on the dash, wind-up windows, and a 150 horsepower engine. The exhaust had a new design and servo-assisted brakes cam standard. Only 2+2 Austin Healey 3000s were for sale. we’re always looking to buy! View more at our ShopperApproved profile.